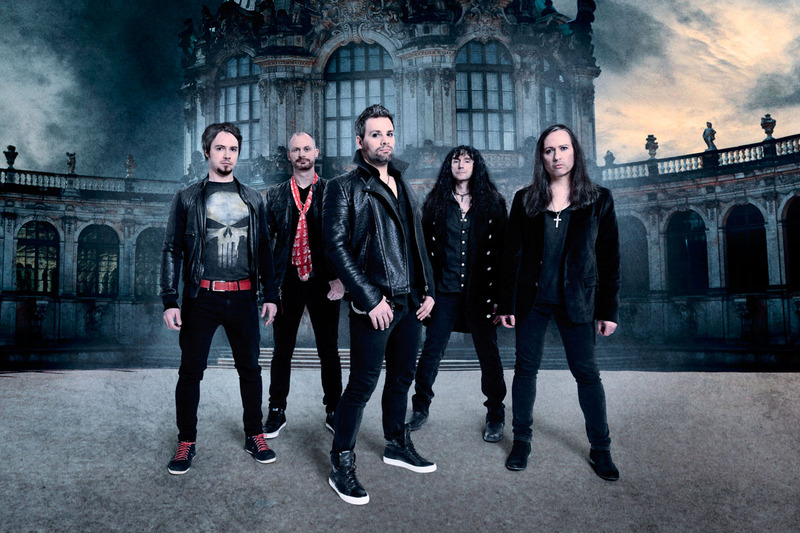 Formed in 2006, Multinational Melodic Metal band Eden’s Curse have risen from their humble beginnings as an internet based studio project to a fully blown touring outfit with five studio albums and one double-live release to their name. During a decade together, they have managed to win over audiences wherever they have played, whilst collecting praise from luminary peers, such as legendary Iron Maiden vocalist Bruce Dickinson and members of Prog Metal giants Dream Theater, who invited them on tour. Touring their latest album, Cardinal, I managed to catch up with bassist Paul Logue to have a brief chat before their Manchester show. With the recording of the latest album, Cardinal, I wondered if it was more difficult to do than previous albums? Is there any increased pressure when you have a successful album preceding it? Or do you not bother with things like that, and just go in and do your stuff? I think certainly for us we always want to better or if not, at least have an album that’s on the same level as the previous one. Cardinal for us, again, was what we felt, in the band and the press, was quite a well-received record. We’ve been fortunate throughout our career most of, actually all of, our albums have been at that mark. The pressure for us to always top that is always pretty strong, but it never dominates proceedings. We’ve been quite a fortunate band where we write. I write, solely for myself first and foremost. In a lot of rock genre there seems to be a lot of guys that have been in a lot of bands, that are helping people out here, there, and everywhere. Alessandro, he plays with everybody, for example. Just leading on to that, just talking about the songwriting partnership, you’re still involved with Pete? I just wondered, do you view him, still, even though he doesn’t play live, still an Eden’s Curse member? He’d be a bit more than an outside writer? Yeah, I think maybe the best phrase is Eden’s Curse family. I think that all the guys, maybe with the obvious exception, have left the band and started with that kind of … People that you can reach out to and call friends? Maybe, Ferdy would be a little bit out there, he kind of does his own thing anyway, but we speak and say hello to each other as cordial, etc. But Pete, certainly, he was a great friend of mine and his leaving of the band was just solely to concentrate on Tainted Nation. So, there’s somebody that comes to you in the group and says, I want to really try something, then, really you base it as brothers, and let your brother go on… If that’s what he wants to do, you got him. After he’s gone, you have to get in a different mindset in terms of songwriting, and into writing for Eden’s Curse? Yeah. But I mean, it’s very natural for him. Because if I write a song, for example, I do write finished songs, completely, but the way that Pete and I wrote for the second album, I started to recognize very quickly on that Pete knew that he was sensational at writing choruses, so unless I had an immediate chorus at hand, which I thought was really strong, I would just leave it blank and finish the song, and then send it to Pete, and I would get the chorus back. But, as we moved on as a band, we said there’s no point, that if Pete was happy with it, of course he was, we’re great friends, we finished very amicably, we said let’s keep the relationship open and keep it going. We were happy as a group and that keeps our continuity going because I never wanted it to be a revolving door of musicians. Do you feel that on the fact that band members come and go, has that disrupted or alternatively, kept it fresh? Because there’s always new ideas coming? I’ve never looked too much at it, to be honest. Personally, from the guys at the top, and watching everything that’s going on, that founded the band, that is a wee bit difficult, and a bit… It’d be great to have the same lineup, but people leave for different reasons. Life goes on around the group, and if you look at Alessandro, he took a career move, which has worked out brilliantly for him, Pete was obviously to pursue Tainted Nation, there’s only been one member of Eden’s Curse fired, in the whole time that we’ve been together. He left of his own accord. So, that’s that, you’ve just got to move on with things, and I’m also a great believer, I mean, if you take Steve, we knew the Power Quest thing was happening. Steve is, I’ve called him in that group, he’s the writer, he’s the guy who runs it all, the brainchild, essentially … He’s going to have to dominate all his time to Power Quest, and I needed more from Steve, and I knew that Power Questwas going on, and we just talked about it. What about the international hinge to the band, was that also planned? Or was it something that just happened? The actual first record was a studio project for me. I had no idea it was going to do so well. So, for me, I was in a Glasgow band for 10 years, and we signed to Now and Then Records, and it gets shelved, never even coming out on Now and Then. I had no idea that it would do so well, I didn’t really have a plan to start a band, but when I started to think seriously about it … Michael was the first guy I found, and he and I talked about all we wanted to do style-wise, and I said, “Right. I’ve got a few songs.” And he heard them and loved them, we were going to write an album around those songs, and that’s what happened, and then we said, “Let’s get a guitar player.” But the main people had to have the same setup, as I have, record this or that way at home, had to be up to a good, professional standard, it took six months to find that. And at that point, boundaries were gone. We never really, I mean … We write probably 20 or 30 songs at least, a week, on a cloud thing, load these things on to the cloud, I mean, where would we be without it. So we all have a Dropbox, again, and we fling the demos up when they’re at a decent standard. And we whip a lot down, and of course we’re very… At that point you’re really looking at what songs could you make up the album with? Is there an Eden’s Curse defined sound, or not? You just go experiment, and see what develops? Yeah, I know where we’re going to go, but we don’t experiment too far. We do push the boundaries, absolutely. But I mean, with different musicians coming in, do they add little bits of their own individuality? I think, yeah. You’ve got to give them the creative license as well, but the main writing team of myself, Thurston, and Pete, has helped to get that, I think, personally, you don’t have to … the guitar sounds quite unique. Having his style of playing, my melodies, maybe something of my lyrics, that the guys take on, that keeps an identity to it. One of the themes on the “Jericho” track, are you a spiritual person yourself? Through other albums, there’s Jerusalem, Holy War… There seems to be that sort of element, I think. Is it just an area you like to dip into, for inspiration? Or is it something that you feel spiritual, yourself? I mean, I’m definitely spiritual. I’m a religious person, but no … It’s definitely not Christian, that’s for sure. But I come from a Christian background, and I’ve been married for 18 years, so I kind of thought I don’t want to write Boy Meets Girl songs anymore. And it was the band’s name that got me to try, not preach, by all means, because actually it, all of the song titles except for things like, “Jericho” in your example, just are historical. It’s picking up the tale, and I always wondered, “The Walls of Jericho” by Helloween, what the hell is that story? I’ve never read it. So, I went out and read, and the history on the subject, and I thought, “That’s not a bad story.” Whether you believe it or not is a different matter, but it’s a good topic for a song. We’ve done, “Jerusalem Sleeps,” but most of the songs, I was going to say to you, are actually from my life experiences, but I wrap them up in a spiritual type… Just to like, bind to the band’s name, and it helps us with the album covers, and themes. I was going to ask about the album covers, and the first video, “Sell Your Soul.” On the red and black colour style, is it linked directly to the album cover, or is it just an idea that somebody had, or what was the sort of theme or message … Any sort of link there? I’m going to ask you again about the artist. Obviously, it seems to be the same artist throughout the bands album covers. That’s the same artist, yeah. Absolutely. No evidence of using another or imitating the style of another, there obviously seems to be a cohesion. It was like a story within the cover! Yeah! And I hate bands that change their logos, you know. If you take Thunder… Thunder, the great old one, they changed it in mid-1990s, and I think they’re probably back to the old one, which was great all along. But for me, I mean, KISS have never changed their logo. So, I always worked at, and we really worked very hard, we were at this to make a logo, something that you could imagine tattooed or drawn on your maths journal, you know, in those days, you used to draw your favorite band’s logos. So, we worked hard with him to do that, and built the covers around it. And we’ve kept it, because it worked. And it works in my head, of what I see Eden’s Curse to look like, and, as you said, a bit as a signature sound that is in my head. Obviously, you’re a band manager as well. Is it difficult to make a career, and sustain a family, a house over your head? As I said, in 2016, is it difficult to sustain a full-time career from music? I mean, obviously, as I say, you do the manager role as well. However, I know a lot of bands, that when they’re not on tour, they’re out working in non-musical occupations. I don’t advertise it, only, but I’ve got a day job. Achieve a certain level of success? Yeah. You’d be amazed, the amount of bands that are headlining places that do day jobs. Bands that have been around for years, and yet still have to go away to put a roof over their family’s heads. Absolutely. There’s two sides to that answer, as well, because I couldn’t do Eden’s Curse without my day job, because I’ve got to finance a lot of it. Amazing support from EFM, there’s no doubt about that. They pay all our productions, they pay to your support, everything, we’ve got a fabulous label behind us. I was talking to people in another band who were also playing here. All the band members were like jobbing, or teaching music, doing different things. They actually said, that they signed with a record label, and didn’t actually help or assist them much. They weren’t even funding a tour. You know? You would expect a record contract to actually pay for something. Yeah, but I think people’s perception of what goes on, is just so far from reality. I mean, a lot of my friends think that I should be driving a Ferrari, and it just shows you that minds are set differently. You know, I would assume that a bank manager’s very well-paid, but I don’t know if they are. Really, do we know that? So, I know most of the guys I know that have a full-time career. If you take Dennis Ward, our producer, he probably does have a paying career at Unisonic, but his bread and butter is his production, that’s where he makes his money. Okay, just a final one. Who you’ve done many of these interviews, but who would you like to sit down, if you were asking the questions? Not even, maybe, doesn’t even have to be a musician. Personal hero, or inspiration? There’s many. I’ve been fortunate in my time, to have met quite a few idols. Like I love Kip Winger in particular, who is a very talented man. I think one of the guys I’ve always loved to have maybe just sat down and have a pint, talk to, would be Coverdale. Probably the only member of Whitesnake I haven’t met. Yet. My favorite band of all time. Yeah? I love David, and I seem to like what I see as his persona, and I think he would be good fun to chat to and have a beer. It’s definitely a professional target in mind, to get him. Yeah, well, we’ve all got dreams, eh?